Sometimes getting confirmation doesn’t really answer the question. 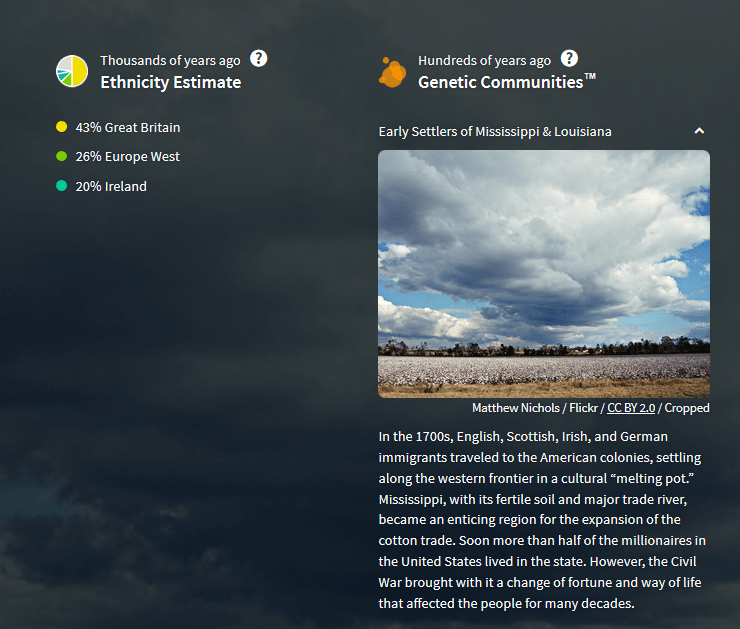 Earlier this year, I decided to take an Ancestry DNA test, hoping to resolve a few life-long questions. Mainly, who was my father’s maternal grandmother. She died when I was pretty young, and I know very little about her or her family. She always seemed a bit mysterious with dark features, so much so that we were sure there was some Native American ancestry. Eastern European, Ashkenazim, or the Middle Eastern ancestry also seemed possible. The test proved that assumption wrong. My results paint a purely Western European picture of primarily English and Irish heritage. We knew those would be there—that’s a given in Mississippi, especially when names like White and Richardson dominate your family tree. We knew where Ferrell came from, as well, and a surprise visit from a distant cousin confirmed that in the mid 90s. Sure there could have been some German if a name change was in play, though there’s little confirmation of that, either. So Esther will remain a bit of an enigma. Perhaps she was what they once called black Irish or maybe she was a bit Cajun, which would explain the Western European markers. Census records do show that she had ties to Louisiana. Whatever the case, she was 100% European—just like me. How surprisingly unsurprising. See an overview of my results here.